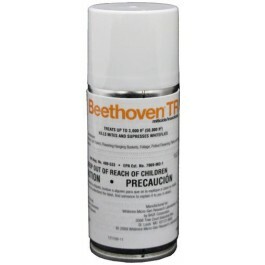 Beethoven® TR miticide/insecticide, with the active ingredient etoxazole, is a new total release aerosol from BASF. It provides control of mites, including the two-spotted spider mite, and suppresses whiteflies. In addition, Beethoven TR offers quick and easy application, thorough coverage, excellent plant safety and flexible re-entry times. This unique total release formulation is also a great Space Mix™ partner with other BASF total release insecticides, including Attain®, 1300 Orthene®, Tame®/Orthene, Pyrethrum® and Duraplex®, giving growers another easy-to-use rotation option for even greater control of greenhouse pests. Where to use Beethoven TR: Commercial greenhouses on bedding plants, cut flowers, hanging baskets, foliage, potted plants and ornamentals. The top of the Beethoven TR can should be at or above the plant canopy before application. Clear out a three-foot area around the can to prep for application. The can should be at room temperature during the application. Close all vents and doors to the area being treated. Shut down all HAF fans just before activating cans. HAF fans should remain off for a minimum of three hours or all night. For single-level plants, choose the low rate; for multiple-level plants, choose the high rate. Do not make more than two applications per crop cycle or within a six-month period of time. Do not use on crops grown for food or feed. Always ready and follow label directions.